Canada, with two victories in their previous encounters, had already confirmed a place in the knock-outs. European champions Spain needed to register a win against The Canucks after the Colombians held them to a surprise draw. La Rojita looked dominant from the whistle, enjoying 66% of the ball possession throughout the entire length of the match at the Estadio Charrúa in Montevideo, Uruguay. Eva Navarro got past Léonie Portelance before sending in a sublime cross to pick out Salma Paralluelo in the far corner. 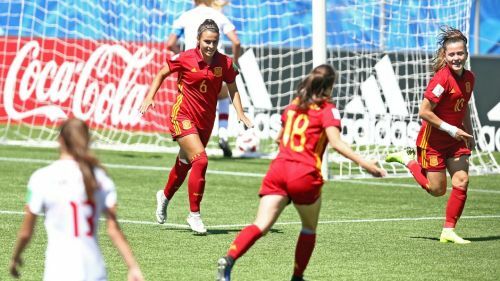 Paralluelo‘s left-footed strike went past the diving Canadian goalkeeper Kayza Massey's outstretched left hand to put Spain 1-0 ahead. Nerea Nevado's diagonal ball found Paralluelo, who sent a beautifully weighted pass from the left flank into the center of the penalty area. Clàudia Pina missed her initial shot which ended up towards Irene López, whose fierce left-footed drive sailed past the diving Kayza Massey. Irene López cutback a superb cross from the right byline, which provided Clàudia Pina with a simple tap in to put the European champions 3-0 up. In the second half, Eva Navarro’s initial shot got brilliantly blocked by the Canadian defense. However, the follow-up shot rifled in by Irene López took a deflection before lodging in at the near post. A weighted through ball from Irene López split the defense to find Eva Navarro who propelled the ball towards the left corner. Kayza Massey got her fingertips to the ball but still could not prevent the fifth goal. Spain managed to get seven of their 17 attempts on target while Canada managed four of their eight shots on the mark. The player of the match went to Irene Lopez, who scored two goals to send Spain on top of Group D.
Group D Standings: Spain 7 points, Canada 6, Colombia 2, South Korea 1. Spain and Canada advanced to the Quarter-finals.